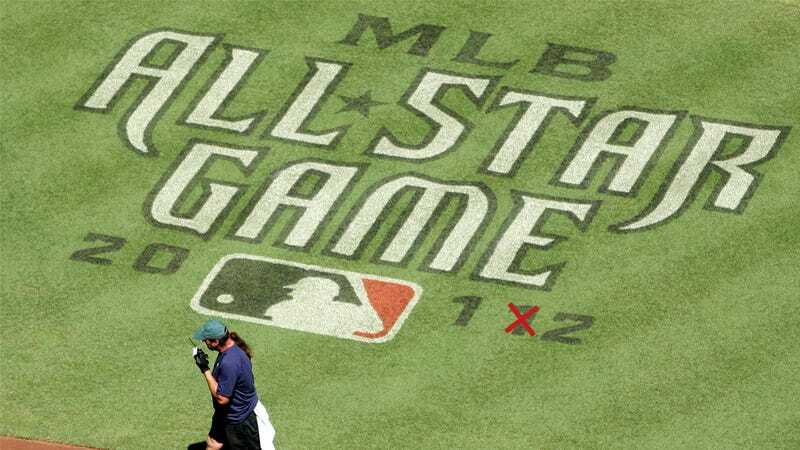 This evening Major League Baseball's brightest stars will gather for a half-hearted nine innings at Kansas City's Kauffman Stadium. It might not be the most exciting game of the year, but it's the easiest way to catch all of your favorite players in one night. So while you prepare to have a few friends over to watch the gamestravaganza, here are a few last-minute suggestions to make the evening even more authentic. You probably don't have tickets or a way to get to Kansas City, so the next best thing to being there is watching the game on an over-the-top baseball-themed TV. Baseball stadium snacks are ridiculously over-priced, but enjoying a hot dog is part of the American pastime experience. And what better way to prep and serve a dozen footlongs for your friends than with an authentic street vendor cart? The only thing that goes better with a stadium hot dog than mustard is a plastic cup full of over-priced suds. And while you won't have a batch ready for this year's All-Star game, this automated microbrewery will let you make your own beer at home for a fraction of the cost of the store-bought variety. But what if you're not the one throwing the party tonight? What if you've been invited to one by your sports-loving co-workers you're desperate to bond with, but they don't realize you're actually a comic book nerd at heart? This Captain American baseball jersey will let you fit right in, while still showing allegiance to your less-accepted obsession. Instead of digging out the folding chairs from the basement, or assuring your friends the carpet is indeed clean for sitting on, you can let every guest sit in comfort and style on these bar stools made from actual MLB bases. But while your friends are perched atop bar stools, you'll be having the most authentic at-home MLB experience possible with these seats salvaged from Old Yankee Stadium.